Author’s note: This is a special edition of Boogers on the Wall. Normally I’d wait to post this on Thursday, but with the legislative session in full swing I don’t want to wait another moment before declaring how I feel about a proposed amendment to the state fire code. Before you ban one of my favorite simple, significant traditions I’d like to let you know what I really think of the one-word “Sky Lantern” amendment to the state fire code that will force me to end the only thing I look forward to on the anniversary of my son’s death. First of all, I’d like to know how a biodegradable piece of floating tissue paper is a big enough issue to warrant so much of your attention. It seems like figuring out how to better control shrapnel sparks from bullets on mountain gun ranges and people who shoot illegal flame-showering firework rockets into the sky would be more effective in curbing Utah’s annual summer fire frenzy. 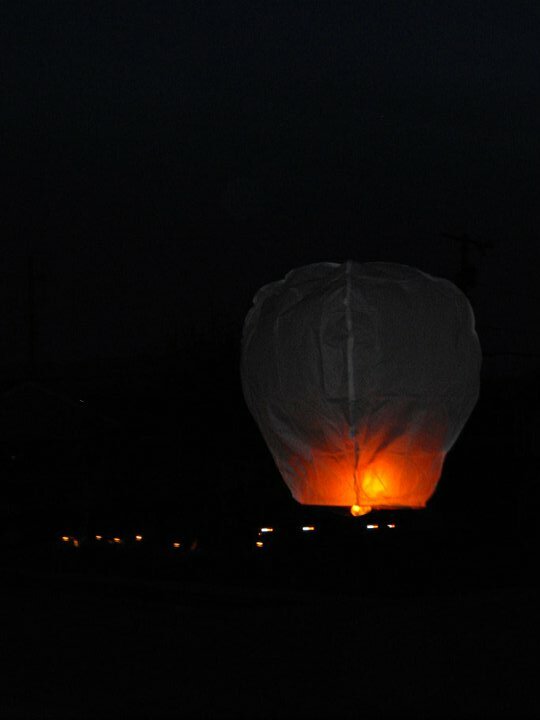 The new legislation, proposed by Rep. James Dunnigan, R-Taylorsville, would identify sky lanterns as “unattended fires,” therefore rendering the beautiful floating lanterns illegal. Have you ever lit one? Have you seen how long the unattended fire burns? Two. Minutes. Max. I have video documentation of several of them rising, floating, extinguishing and falling. Well, you better ban little toy magnifying glasses and boxes of strike anywhere matches while you’re at it. And how about those throw down snappy things that kids chuck at the sidewalk, even they might pose some sort of fire threat. In 2011, 355 fires in Utah were classified as “cooking fires, confined to a container.” Does this mean you are going to force Utahns to stop grilling? Should I cancel my plans for my annual Memorial Day barbecue too? That same year 575 fires were described as “Passenger vehicle fires.” Am I going to be able to continue to ride in a car? Accidents happen. I understand that there is a small possibility that a stray lantern could malfunction and light another object on fire. I’ll even acknowledge that a neighbor’s tree caught fire after Jimmer Fredette lit hundreds of lanterns last May at his wedding rehearsal in Denver, and that last summer a St. George-wildland fire was started by a sky lantern. But just because accidents happened and something could be a threat, doesn’t mean that the government should intervene upon my freedoms and tell me that they are going to start controlling yet another small, harmless part of my life. To propose an amendment that forces me to stop memorializing my son in a simple, elegant way, is yet another unnecessary government control. If the state of Utah banned everything that Utahns do that might damage property, we’d all end up sitting on couches all day staring at our televisions. Maybe specific condition-based restrictions are a better idea for the lanterns. Like banning them in the scorching summer months when the dry, brittle grass is more likely to ignite, or not allowing them when it’s windy. Maybe then I wouldn’t feel like I was once again being told what I couldn’t do with my life. We have sent lanterns into the sky each year on my son’s birthday. He was born stillborn April 22, 2010. As my family and I watch mesmerized by the lights raising in the sky it fills me with hope. Hope that my little baby can somehow see the same lights I see. Hope that he may be able to reach his little hand out to touch the top of one of the lanterns. Hope that someday I’ll see him again. It may sound cheesy, but those lanterns have peacefully connected me to my son the past two years. I like to think they are his floating birthday candles that he blows out before sending back down to me on earth. The proposed amended fire code will extinguish that sense of hope. Luckily, if passed it would not be implemented until this summer. That means I’m going to light up the sky with them this spring.